Major technology publication NASA Tech Briefs features Pangolin’s LASORB component for 445nm laser diodes in its November 2010 issue. Dec. 14, 2010 - PRLog -- ORLANDO, Fla – Pangolin Laser Systems Inc., creators of the LASORB component, and the world’s largest producer of laser display software and control hardware recently had an article featured in NASA Tech Briefs, a major publication addressing the scientific, engineering, and technology manufacturing sectors. The article, published in the November 2010 issue of NASA Tech Briefs, discusses how Pangolin has expanded its LASORB product line with a series of components designed to protect 445nm laser diodes from damage caused by electrostatic discharge (ESD). LASORB is the world’s first electronic component designed specifically to protect laser diodes from direct and indirect electrostatic discharge (ESD) and power surges. Developed in 2008 by Pangolin’s President and CTO; Mr. William Benner, LASORB protects laser diodes, LEDs and superluminescent diodes from single, multiple, and repeated ESD events of both positive and negative polarity. Laser diodes are known to fail long before the manufacturers’ rated life expectancy, and ESD is a suspected cause in many of the malfunctions. With the global market for laser diodes at around 750 million units per year (Laser Focus World), LASORB has been a cost effective means for many companies, in multiple industries, to protect their laser diodes from ESD and power surges. Pangolin is producing three separate lines of LASORB, one optimized for red and infrared diodes, one optimized for BLU-RAY diodes, and one optimized for 445nm blue laser diodes. 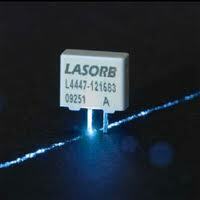 The LASORB website (www.LASORB.com) offers detailed product information and datasheets, and related information on laser diodes and ESD. Videos demonstrating the effects of ESD on laser diodes and the effectiveness of LASORB in protecting them are available at http://www.lasorb.com/11_videos.htm. For more than three decades, NASA and its contractors have been reporting new, commercially-significant technologies developed in the course of their R&D, so that engineers, managers, and scientists could use this valuable information to improve their competitiveness and productivity and this has been accomplished primarily through the publication of NASA Tech Briefs. First issued in the 1960s and converted to a magazine format in the 1970s, NASA Tech Briefs has been a joint publishing venture of NASA and Tech Briefs Media Group (New York City) since 1985. Today, NASA Tech Briefs’ qualified circulation surpasses 190,000. For more information on NASA Tech Briefs, visit their website at www.TechBriefs.com. Since 1986, Pangolin has amassed over 15,000 clients in 63 countries firmly positioning themselves as the world leader; providing software and hardware solutions to the laser display and text message industries. The company, with offices in the USA, Central Europe, and Mainland China, has received more than 20 awards for technical achievement and product quality, and their software has contributed to more than 250 Artistic Awards for its users. Pangolin has products being used by some of the largest events, companies, and brands currently known, including major theme parks such as Disney World, SeaWorld, Universal Studios, and Six Flags; major motion picture companies such as 20th Century Fox and DreamWorks pictures; high-tech companies such as PC Magazine, Boeing, and Lawrence Livermore Labs; popular brands such as Mountain Dew, T-Mobile, and Motorola; major sports teams and events such as the Orlando Magic, Philadelphia Eagles, and Super Bowl XLIV; and top-named musical talent including Madonna, Drake, Usher, Metallica, the Black Eyed Peas, Jennifer Lopez, Shakira, Jean Michel Jarre, Justin Timberlake and many others. William Benner, Pangolin’s President and CTO, is a best-selling author and internationally recognized software and hardware developer from the United States. He holds numerous Patents, and has received personal letters of commendation from President Ronald Reagan and Florida Governor Bob Graham. He has also been published in the SMPTE Journal, The Laserist, LaserFX, US Tech magazine and Motorola's Embedded Connection magazine. He represented the state of Florida in the United States Skill Olympics and represented the U.S. in the International Skill Olympics trials, receiving gold medals for each. Benner has also received the International Laser Display Associations’ highest accolade, the Career Achievement Award. For more information on Pangolin, and their award winning line of products, visit their website at http://www.Pangolin.com. For more information on the LASORB device, visit http://www.LASORB.com, or see it in action at the 2010 SPIE Photonics West Exhibition, where Pangolin will be showcasing the product at their booth (#2035 in the South Hall). Pangolin is a global corporation, that specializes in creating software and hardware solutions for the laser display and text messaging industries. Products allow users to create award winning laser light shows, and run text message marketing solutions.